By 2025, CPG is expected to account for 20% of total digital revenue. Consumers expect CPG brands and manufacturers to tailor product experiences to the further-fragmenting methods of digital shopping, according to a recent Salsify survey . At the core, requires creating a competitive product experience, to include convenience, information, and community. Taking the lead in this category are retailers that can deliver these experiences - such as warehouse clubs, discount stores, and online grocery outlets such as Amazon Fresh, Jet.com, Instacart, Boxed, and Fresh Direct. 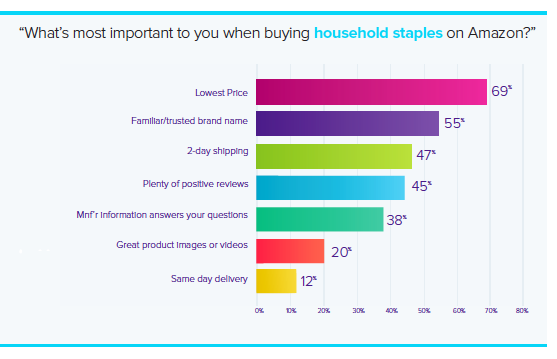 Here are the top 5 things that shoppers want when they go online to buy the basics. Twenty percent of consumers say it’s easier to locate grocery products online. Brands must supply product information in the consumers own language. Make it as easy as possible for consumers to locate products they want, based on their own personally relevant search terms with few simple keywords. 77% of shoppers use their mobile devices even while physically in-stores. Consumers are comparing competitors’ prices, looking for product reviews and more information, sending information to someone else, and looking for similar products that might more accurately fit their needs. CPG brands must think mobile when building content for the product page. No product is too small to warrant relevant content. Hand soap, plastic utensils, and mayonnaise, all now get vetted before purchase. Consumers have specific product attributes in mind, like allergy sensitivities, less processed sugar and healthier ingredients, more natural body care, and environmentally friendly and sustainable packaging. In fact, 81% of consumers will give up convenience to reduce their impact on the earth. For CPG brands, personalized and tailored content is more important than ever. Our research for that 78% of consumers are more likely to buy when the product page content is personally relevant. Desiring to connect to companies behind the products, consumers want to leave, read, and receive acknowledgement of reviews. Companies that either don’t respond to consumers or make consumers feel wrong for their opinions will be abandoned. 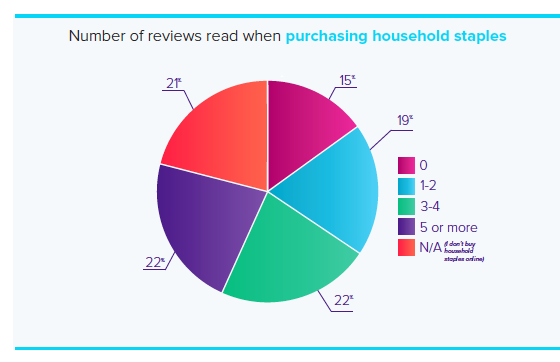 After all, as we found, 44% of consumers want to read at least three reviews and 38% find answers to questions to be most important when researching products. Amazon Dash, Instacart, Blue Apron, and the many subscription services are examples of how the CPG consumers’ appetite for ease and convenience has shifted what products they consider for purchase. Ordering online and picking up in-store is favored by 40% of shoppers, according to a report by IRi. Additionally, 12% will lean on subscription services for some groceries and 24% will order online and opt for home delivery – wherein 58% of millennials, 57% of Generation X, 49% of baby boomers, and 39% of seniors will expect the shipping cost to be free. The bottom line? When brands deliver an informed and relevant experience on the product page – and back it up with an exceptional product – consumers return, write reviews, and create a virtuous cycle for the brand itself, building trust and loyalty in the process.